Guess what I got to do today? I had lunch with Lori of Lori's Reflections and Iris of Laced with Grace and Grace Alone! I was so excited! 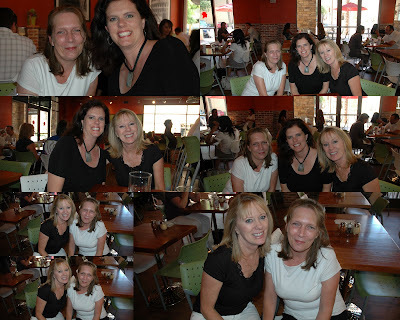 Lori was visiting family in the Phoenix area and so she arranged this meet up with Iris. It was the first time I met either one of them ...in person. But let me tell you. I love these women. We've been following each other's blogs and so we already knew each other. But there's always a little bit of anxiety before meeting someone you know online. Some of you know what I'm talking about, don't you? We had so much fun ...talking and talking! And get this. Lori picked me up at my house and when I opened the door ...we were dressed alike! Can you believe it? We started laughing because we both had black tops and white capris along with black flip flops. And no, it wasn't planned. And then when we arrived at Sauce (the name of the restaurant), Iris was wearing white and black too. Only she had a white top and black slacks. Only bloggers, right? Besides blogging we have a common love for our Lord and that makes all the difference. I'm so thankful for both Lori and Iris. And meeting them in person only caused me to love them more. Have you had an opportunity to meet other bloggers yet? You three are so gorgeous! I can see the light of our LORD in your faces and smiles. Only the LORD could hook up hearts that connect so well that you even dress alike! I LOVE IT! He's so amazing!!! My husband often says, "The Lord has as sense of humor". He's so right. I think you three made HIM smile brightly! I love you Debbie, Iris and Lori! And on Friday....I will have the pleasure of meeting Lisa Smith from The Glad Chatter. I can't wait to meet you Debbie in person. We're sisters after all. Love ya. You are all so beautiful and the joy is so brightly shining! I can't wait to meet you in person Debbie - but we will need to promise to bring LOTS of tissues to catch our tears of joy! You are all lovely blessings, so happy you were able to meet. I have met Marsha, love her. This is so cool that you guys got a chance to meet in person after so many months of blogging. Love the pics. So glad you had a fun lunch with the sisters. I haven't had to chance to meet anyone in person YET but I know I will someday! That is so nice to know that blogging friends are meeting and had good time. Oh cool to be able to meet yet more wonderful blogging friends. I've only met 2 so far but can't wait to meet more! It's just icing on the cake when you do. I'm glad you were able to meet even MORE bloggy friends. You look beautiful! I see you got your hair cut too. How fun! There are some of us in my area who are planning on getting together in the spring. I'm looking forward to it. Awwww...that's so sweet!~ I'm almost jealous - because I love all 3 of you and wish I could have been there too! PTL! Hugs!! Oh what beautiful girls you all are!!! I WISH I were there!!!!! I am so blessed to be among such sweet hearts and lives as you 3! I bet you all looked like a little singing trio all dressed alike!!! I have studied the pictures. You must be perfect blogging sisters. Dressed alike, almost same hairdo and those happy smiles! May your friendship last and your bonds grow stronger blog by blog. If the Lord will, I just might go to America next year to meet my scarf sisters. How fun and it makes me hope that my lunch with a blogger today will be just as fun! It was such a blessing for me to meet the two of you for lunch. God knew I need that time with the both of you considering the news I was going to get later on in the day. God knows what my heart needs, and at the time it was to be surrounded by some God Girls.